Koko NYC provides art-based building and technology classes in-school and after-school programs throughout New York City. 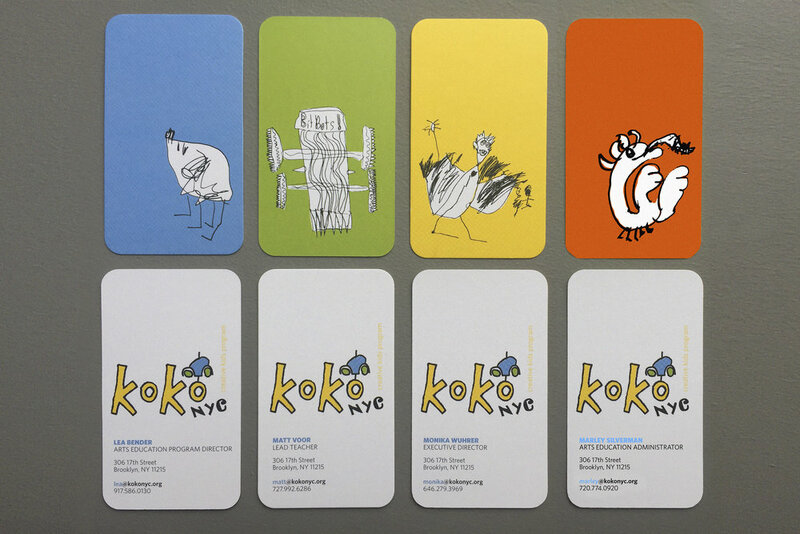 Koko NYC was started by Open Source Gallery founder Monika Wuhrer in 2007. With three boys of her own, Monika saw a need for classes and workshops in Brooklyn that support children’s natural curiosity and innovative thinking. She also noticed a daily abundance of free art supplies appearing like magic outside her Brooklyn home and gallery space in South Slope: printers, furniture, bottles, blenders, boxes, toys and so much more! As KoKo OpenSource grew they felt it necessary to separate the brand from the gallery. We were brought in to rebrand to KokoNYC and let it stand tall, on it's own, in its new space. Monica had collected piles of crazy drawings from the kids over the years. We had the perfect place to bring them back to life! It also made great use of the new color scheme. KoKoNYC participates in many camp fairs and events, they needed something to show off all the fantastic things they do. They were looking for something with a bit more impact rather than a plain old brochure and as a non-profit organization keeping things to a tight budget is always top priority. So we designed a series of large format postcards, easily transportable and large quantities for people to take as reminders and hang on their wall. Each director has their own monster drawing to represent them. Teachers, because there are so many, have a BitBot robot as their character. We also designed a website for KoKoNYC that they can easily update and maintain. We like to keep an eye on it though to make sure it's still running smoothly.